Joseph Colon (ca. 1420–1480/4) is considered to be one of the last representatives of medieval French Jewry, and the seminal figure in Italian and Ashkenazic rabbinic jurisprudence in the fifteenth century. His contemporaries turned to him for adjudication in matters of halakha and civil disputes. On the title page of the most complete, modern edition of the Responsa of Rabbi Joseph Colon he is referred to as the cornerstone of Rabbi Joseph Karo’s Shulhan Arukh, the authoritative code for Judaism for almost five centuries. Colon’s responsa are indeed one of the fundamental works on which it is based. This letter is one of two surviving examples of auto- graphs by Colon. The other is housed in The Library of The Jewish Theological Seminary, New York (MS Rab 1533). The letter displayed here is addressed to his disciple, Rabbi David of Modena (ca. 1440–after 1518), a rabbi in Bologna. 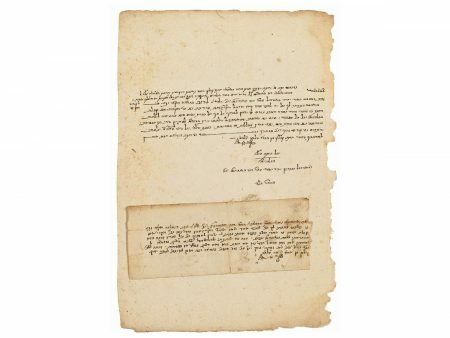 In the letter, Colon is concerned with obtaining help in Rome for the maintenance of two synagogues. Details concerning this case are otherwise unknown. On the reverse of the letter is written the usual admonition for protecting the privacy of the correspondence. Responsa 1984, pp. 19–49; Woolf 1991, pp. 239–240; Woolf 2001, pp. 151–180.